Ahoy Mateys! Shiver me timbers, there be pirates among us! In honor of the legendary pirate Jean Lafitte, the annual Pirate Festival will be making its way back to Lake Charles, with a Costume Ball to boot! As a fan of the Texas Renaissance Festival, and a loyal fan of their Pirate weekend, I am extremely pumped about this news! The Pirate Festival Costume Ball will begin with an opening reception from 7:30-8:30 PM on May 11 at the Lake Charles Civic Center’s aptly named Buccaneer Room. The night will then unfold with pirate-pleasing cuisine from local restaurants - like “Catch of the Day” fried fish bites from Steamboat Bill&apos;s, Walk-Ons&apos; “Peg Legs” chicken, “Golden Nuggets” hushpuppies and corn fritters from Seafood Palace, and "Gator Bait" sausage from LeBleu&apos;s Landing. YUM! Be prepared to dance the night away to high energy bands like Mixed Nuts and The Whiskey Bay Rovers. The ball also has a “Message in a Bottle” fundraiser and live auction that will provide the opportunity for you to take home fabulous prizes AND benefit the St. Nicholas Center for Children! As much as we all want to look and dress authentically, it can be really expensive getting the kind of costume attire you’re looking for, especially if you don’t know where to look. Here are some money-saving tips on how to get your pirate gear together! 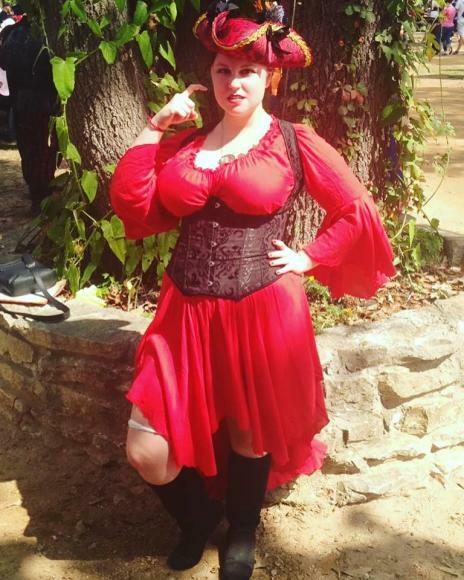 Owner Edwina Medearis is getting all of her pirate attire out on display and taking orders for custom corsets now! 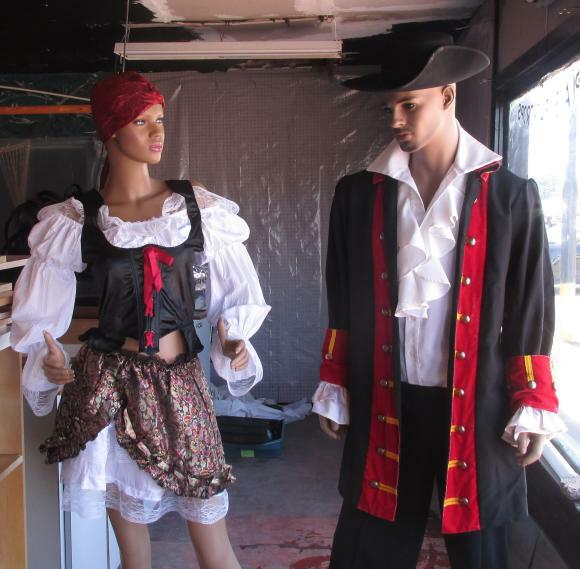 Ruffled shirts, pirate hats, jewelry, and props await at this charming local costume shop. Prices are very reasonable and it’s a great place to get the perfect pirate outfit custom made for you! Locally owned and operated since 1969, The Party Time Store has been serving the Lake Charles area for nearly 50 years! 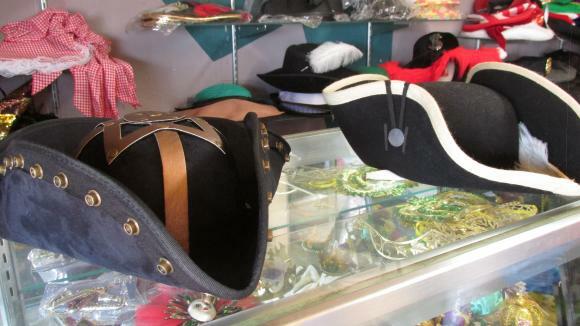 With an array of hats, masks, and general pirate gear available now for the upcoming Pirate Costume Ball, this is one local shop that you want to check out! If you are looking to build an authentic costume with good base pieces that will last you for years to come, these sites are a great start! Based out of Austin, where the Sherwood Forest Faire is held every year on weekends in March and April, this website sells tons of decently priced pirate and gypsy gear that is really durable and well done. This site lives up to their name! While they offer an amazing variety of corsets, they also have other Victorian style clothing, skirts, dresses, footwear, etc. This website also has a ton of flash sales, clearance items, and discounts available, so it is definitely worth checking out! Get your pirate costumes together and set sail for an adventurous night in the Caribbean! Hope to see all you scallywags there! Save your pirate swag for the rest of the festival! There are several events to enjoy including pirate street and boat parades, costume contests, bed and bathtub races and barbecue cook-off! Check out the whole list of events at www.louisianapiratefestival.com! To make sure you don’t miss out on any other festivals or events in town, check out our Calendar of Events and download our Free Events App!